Be sure to enter the Talbot’s contest! Also check out my sale blog. Lots of items at low prices. FYI, I will be pulling some items down on Wed or Thu to take them to consign, so check them out soon. J Crew has used the glimmer cardigan product name for 3 items now. 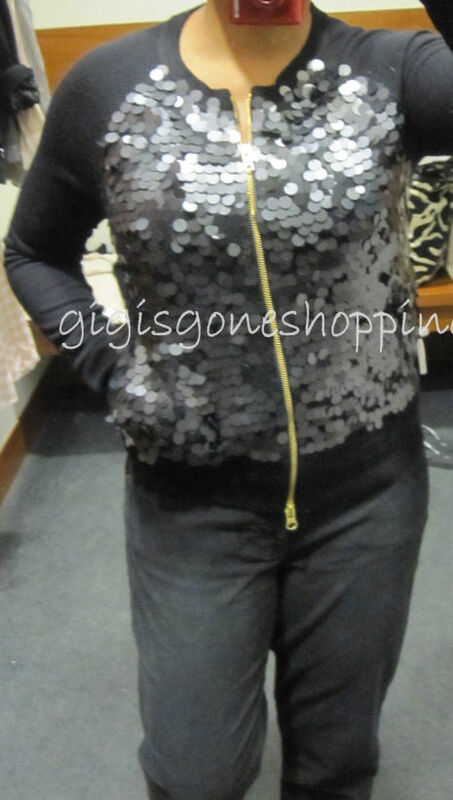 I tried on last year’s glimmer cardigan in this post. This year’s whisper glimmer cardigan (29185) is now on fs online and on sale in-stores. It comes in 2 colors and runs XS – XL. Whisper glimmer – metallic grey – Size S – It’s probably best worn in good lighting where it can sparkle. I wasn’t enamored, but then I have cardi overload so that’s where I’m coming from. I see that the shoulder seam extends past my shoulder. An XS might be a better fit, which means those thinner & smaller might be sized out. The description doesn’t say it’s a boyfriend or looser fit. Probably good to contact customer service for at least the chest measurement if you’re ordering online. Check it out on Cleo (scroll to bottom 1/3). The following sweater is also called a glimmer cardigan (28147). It runs XS – XL. The color choice is black. p.s. Remember Ebates. Click here to join if you need to sign up. Jenni – You're welcome. It looked like you had fun. The pink color is prettier on the rack than the silver. I think it's fairly subtle. Definitely less pronounced than the paillettes glimmer cardigan. I really like the sequined card. I like the look of the whisper glimmer cardigan. Tried it on when it first came out in a Small. I could not have sized down. The issue i had with it is i found it very itchy, likely due to the metallic combo wool. Thanks for dropping your link to the whisper glimmer. Will add. This smartphone is available for a limited time for $29. a with a single LED flash, but as you would expect there is now optical image stabilization (OIS) on offer here. the ultimate in smartphones, it still was the phone that showed the way. on monthly or annual contracts, and you can also get excellent pay-as-you-go deals. They get into a relationship with another person, and in the beginning, the relationship seems promising. I simply want to tell you that I am newbie to blogs and honestly savored your page. Very likely I’m likely to bookmark your website . You definitely have terrific articles. Regards for sharing with us your blog site. I simply want to say I am new to blogging and seriously savored your blog site. Almost certainly I’m going to bookmark your site . You actually come with terrific well written articles. Many thanks for sharing with us your website. I simply want to tell you that I am very new to weblog and absolutely savored you’re web site. More than likely I’m planning to bookmark your website . You amazingly have excellent well written articles. Cheers for sharing with us your webpage. I simply want to mention I’m new to blogging and absolutely loved you’re website. Most likely I’m going to bookmark your website . You absolutely have wonderful posts. Thank you for sharing your website page. I just want to tell you that I am all new to blogging and definitely savored your website. More than likely I’m likely to bookmark your website . You really come with superb articles and reviews. Bless you for sharing your blog. I just want to mention I am newbie to blogging and honestly liked this web page. Probably I’m likely to bookmark your blog . You really come with wonderful writings. Appreciate it for sharing your web page. I just want to tell you that I am all new to blogs and certainly savored you’re web blog. More than likely I’m going to bookmark your website . You surely have impressive article content. Cheers for sharing with us your web site. Wow, amazing blog format! How lengthy have you ever been running a blog for? you make blogging look easy. The whole look of your web site is magnificent, let alone the content material! I just want to mention I am just beginner to blogging and site-building and absolutely enjoyed you’re web site. More than likely I’m likely to bookmark your site . You surely come with terrific article content. Thanks a bunch for revealing your web site. I simply want to mention I am just very new to blogging and site-building and truly enjoyed you’re web blog. More than likely I’m want to bookmark your website . You absolutely have superb well written articles. With thanks for sharing with us your web-site. Hi my loved one! I want to say that this article is amazing, nice written and include almost all important infos. I would like to peer extra posts like this . Hey very nice blog!! Man .. Excellent .. Wonderful .. I’ll bookmark your site and take the feeds also¡KI’m happy to find numerous useful information here within the submit, we want work out extra strategies in this regard, thanks for sharing. . . . . . I just want to mention I’m beginner to weblog and seriously loved you’re website. Likely I’m likely to bookmark your site . You surely have fantastic article content. Appreciate it for sharing with us your website. I simply want to mention I’m all new to blogging and site-building and definitely enjoyed you’re blog. Likely I’m want to bookmark your blog . You really have very good articles. Many thanks for sharing with us your blog site. It is appropriate time kalysdi to make some plans for the longer term and it is time to be happy. I have learn this post and if I may I wish to recommend you some attention-grabbing issues or suggestions. Perhaps you could write subsequent articles regarding this article. I want to learn more things approximately it! I’m really impressed with your writing skills as well as with the layout on your blog. Is this a paid theme or did you modify it yourself? Either way keep up the excellent quality writing, it’s rare to see a great blog like this one these days..
Three removals are as bad as a fire. I was just searching for this information for some time. After 6 hours of continuous Googleing, finally I got it in your web site. I wonder what’s the lack of Google strategy that don’t rank this kind of informative sites in top of the list. Normally the top sites are full of garbage. I have to express my appreciation to the writer just for rescuing me from this particular problem. Because of searching through the internet and meeting basics that were not pleasant, I assumed my entire life was well over. Being alive devoid of the strategies to the problems you’ve solved by means of your main posting is a critical case, and the kind that would have adversely affected my career if I had not encountered your web blog. Your primary ability and kindness in maneuvering all the details was very useful. I don’t know what I would’ve done if I hadn’t come across such a step like this. I am able to at this time look forward to my future. Thank you so much for your high quality and result oriented guide. I will not think twice to refer your site to anyone who wants and needs direction on this situation. hi!,I like your writing so so much! proportion we keep up a correspondence extra about your article on AOL? I require a specialist on this house to unravel my problem. Maybe that is you! Taking a look forward to peer you. fantastic submit, very informative. I’m wondering why the opposite specialists of this sector do not understand this. You must continue your writing. I’m sure, you’ve a huge readers’ base already! whoah this blog is magnificent i love reading your posts. Stay up the great work! You already know, a lot of persons are looking round for this info, you can aid them greatly. hello!,I like your writing very so much! share we communicate extra approximately your article on AOL? I require an expert in this area to resolve my problem. Maybe that’s you! Having a look forward to peer you. Thanks for some other informative blog. The place else may just I am getting that kind of info written in such a perfect way? I have a challenge that I am simply now operating on, and I’ve been at the look out for such information. I must express my appreciation to you for rescuing me from this crisis. As a result of browsing through the search engines and obtaining strategies that were not productive, I assumed my entire life was gone. Living without the presence of answers to the issues you’ve fixed through the short article is a crucial case, and the kind that might have in a negative way damaged my career if I hadn’t come across the website. The understanding and kindness in handling every part was very helpful. I am not sure what I would have done if I hadn’t come upon such a subject like this. I can now look forward to my future. Thanks a lot so much for your reliable and amazing guide. I will not hesitate to refer the blog to any person who wants and needs assistance about this subject. Thanks a bunch for sharing this with all people you actually realize what you’re speaking approximately! Bookmarked. Please additionally seek advice from my site =). We may have a hyperlink alternate arrangement among us! I like what you guys are up too. Such intelligent work and reporting! Carry on the excellent works guys I’ve incorporated you guys to my blogroll. I think it will improve the value of my site :). With havin so much written content do you ever run into any problems of plagorism or copyright violation? My blog has a lot of unique content I’ve either written myself or outsourced but it seems a lot of it is popping it up all over the web without my authorization. Do you know any techniques to help prevent content from being ripped off? I’d genuinely appreciate it. Good ¡V I should definitely pronounce, impressed with your web site. I had no trouble navigating through all the tabs and related information ended up being truly easy to do to access. I recently found what I hoped for before you know it at all. Reasonably unusual. Is likely to appreciate it for those who add forums or anything, website theme . a tones way for your customer to communicate. Nice task.. I seriously love your site.. Very nice colors & theme. Did you make this web site yourself? Please reply back as I’m wanting to create my own personal blog and would like to find out where you got this from or what the theme is named. Appreciate it! hey there and thank you for your info – I have certainly picked up anything new from right here. I did however expertise a few technical points using this site, since I experienced to reload the website many times previous to I could get it to load correctly. I had been wondering if your web host is OK? Not that I am complaining, but slow loading instances times will very frequently affect your placement in google and could damage your high quality score if advertising and marketing with Adwords. Anyway I’m adding this RSS to my email and can look out for a lot more of your respective fascinating content. Ensure that you update this again very soon..
You are my intake , I possess few web logs and often run out from to post . I truly love your blog.. Excellent colors & theme. Did you make this web site yourself? Please reply back as I’m looking to create my own personal blog and want to know where you got this from or what the theme is called. Thank you! excellent submit, very informative. I’m wondering why the other experts of this sector do not understand this. You must proceed your writing. I’m sure, you have a great readers’ base already! Hi, I do believe this is an excellent web site. I stumbledupon it 😉 I am going to return yet again since I bookmarked it. Money and freedom is the best way to change, may you be rich and continue to guide others. Very good write-up. I certainly appreciate this website. Continue the good work! I as well as my buddies were checking the great procedures located on your website and so then I had a terrible feeling I never thanked the web site owner for those techniques. These guys appeared to be totally passionate to learn all of them and have very much been using them. I appreciate you for simply being indeed helpful and for going for varieties of extraordinary resources most people are really desirous to discover. My personal sincere regret for not expressing gratitude to you sooner.